This playful and friendly female pittie needs a home. She's loves humans, including children, and gets along very well with males. We are unsure about whether she gets along with other females. She has a moderate level of energy. She should be walked, but she would do just as well as a couch potato watching television with her humans. 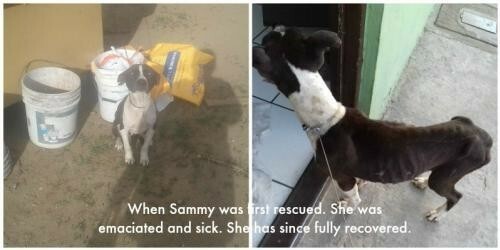 History: Sammy was very emaciated and sick when she was rescued. Someone tied her skinny frame to a bucket and left her there. (Photos attached.) It is unknown how long she was there before she was saved. She had corneal edema in both eyes. They have been significantly reduced with medication; however, she managed to accidentally scratch her cornea in her left eye, which required another type of medication. Her prognosis of it completely healing is positive. She had ehrlichia, but that has been 100 percent resolved with medication. Sammy is now healthy, fully vaccinated, and sterilized. She is now anxious for a forever home. She was house trained at her prior foster's home, but she is now with another foster and sleeps in a kennel at night. She plays with her buddies during the day. The adoption fee is only $1.00. Our application process and due diligence is rigorous. Potential adopters must agree to the stringent terms of our adoption application. The foregoing and the $1.00 adoption fee constitute the consideration of the party adopting the dog. In return, the adopting party will receive a wonderful and faithful dog Thank you for choosing rescue!